Located: C J Langenhoven Road in the grounds of De Bult School. Dated 1861 on gable of the building. 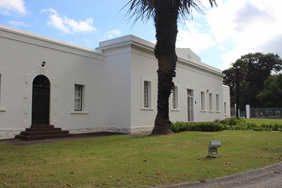 In 2004 the building was restored and converted into the offices and training facilities for The HRD Institute (Human Resource Development) in George. Prior to this it was used as part of "de Bult School.